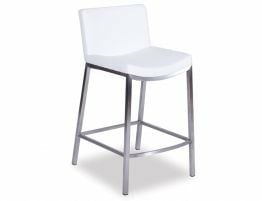 The Vague barstool in white offers a chic, contemporary style for your modern kitchen counter dining area or breakfast bar. 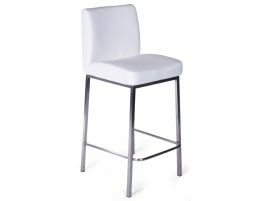 Whether you lean toward a refined, minimalist space or maybe you want a stylish stool that elevates your space without taking over., either way, the Vague white padded breakfast bar stool offers attractive, refined contemporary barstool style. This four post metal barstool has been constructed with a brushed stainless steel frame that looks incredible beside your stainless steel appliances creating a unified theme in your space. 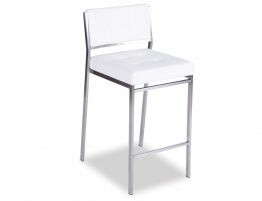 Likewise, the Vague white and steel kitchen bar stool is finished in an easy care, durable fabric that offers a white leather like feel and finish. These fixed height barstools offer a crisp, contemporary esthetic that is boldly simple. 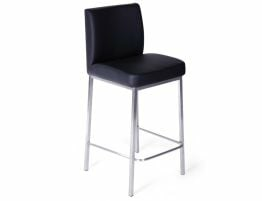 With a gentlly sloped, padded seat, the Vague counter stool is a comfortable barstool and the Ocean's half back rest offers a streamlined form that makes this stool look unobtrusive and attractive alongside your counter or breakfast bar. Thoughtful and expert construction make this barstool sturdy and stable and non-marking feet pads protect your flooring. 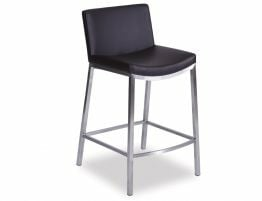 The Vague modern barstool is offers a design that exemplifies a pared down modern look. At Relax House furniture, we work hard to find quality barstools that are affordable and we have high standards for both appearance and performance. The Vague white kitchen stool hits all of our important furniture benchmarks. This contemporary barstool is also available in black, cream and brown to make certain you find the colour that fits your interiors best.